1. Cook the pizza according to pack instructions. Meanwhile, using a sharp knife, very thinly slice the lemon (including the skin). Discard the ends and place into a large salad bowl. 2. Slice the fennel and celery into wafer-thin slices and add them to the bowl. 3. Remove the leaves from the mint and finely shred half of them. Add the shredded mint, remaining whole mint leaves, dill and the olive oil to the other ingredients in the bowl. 4. Season and toss together. 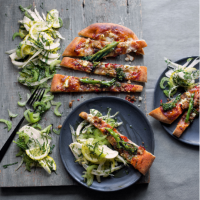 Serve with the Waitrose 1 Wood-fired Spicy Sausage & Tenderstem Broccoli Pizza.